As we were eating dinner Saturday night, the cat (his Christian name is Attila but I usually call him “the cat”) came into the kitchen meowing. Then he gave a long, loud meow that didn’t sound like him it actually caused goosebumps to run up my arms. I leaned over to see what was wrong and discovered he wasn’t meowing. Chewy and I exchanged looks of alarm, then I warily peeked out the window to see a grey and white cat sitting in front of my car, beckoning to us to either let him in or send our cat out. The meow itself had been creepy, add to it that the sun had already set and the cat was meowing at our side door, the one we use most. Chewy started to freak out, saying the cat was evil and sinister and under no circumstance should I feed it (because the little girl inside of me wanted to keep the cat, even if it weirded me out a bit). We got Stormy ready for bed and I kept running back to the window to check on our little friend, who at this point looked as though he were dramatically laying across the driveway with a paw at his head. At some point, Chewy had said his first thought was that a person was outside our house meowing, because it had been so loud and stressed. I found myself being more scared than usual when I would hear a noise, like a light tapping against our back door, which currently has no steps leading up to it, or when I would look out a window, not certain if I would see the cat closer to the house or right up on the window…or worse, a person. Chewy’s insane thoughts about the cat being evil and sinister had entered my mind and I realized for the first time that it might be scarier inside his mind than my own…and that’s saying a lot…I freak myself out all the time. Even as I lay in bed Saturday night I would hear a creak in the hallway and my heart would race with the thought that somehow this cat had gotten into our home. Sunday, when we returned home from dinner at my parents’ house, the cat was sitting on our side porch, staring at us as though he’d been waiting for our arrival. Chewy was not happy – I promised I hadn’t fed him. He “ran away” two feet and then stopped and watched us as we got out of the car. That’s when I saw a bunny frozen in the grass. I was torn, the cat was creepy but I needed to buy the bunny time to get away, the last thing I needed was for this cat to murder a bunny in front of Chewy. Chewy’s main concern was keeping the cat away from us. So we were at odds with each other, Chewy trying to scare the cat away and me trying to keep his attention on us. 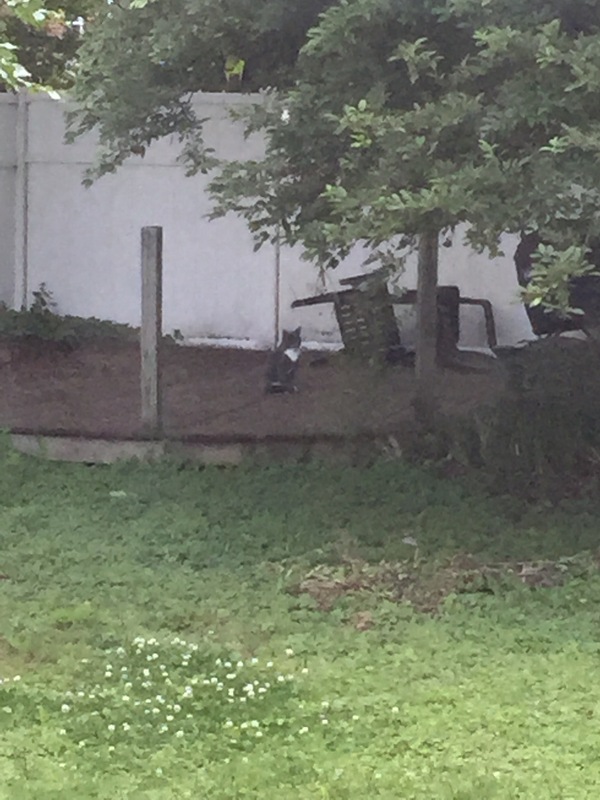 Chewy won and the cat turned to run further into our backyard, the bunny bolted and then the cat went after it. I made desperate noises trying to get the cat’s attention, and it worked! Though to Chewy’s relief it didn’t work so well that the cat actually came toward us. I haven’t seen him today, though I went to the backyard to mow the lawn and I was genuinely scared that he would pop out from beneath the shed, or that I would turn around to find him watching me. And yet – I’m kind of sad I didn’t see him. That post freaked me out just reading it!